Trinidad & Tobago 2-119 (Lendl Simmons 63, Evin Lewis 38, Suresh Raina 1-16) beat Chennai Super Kings 118 (Suresh Raina 38, Murali Vijay 27, Rayad Emrit 3-21, Lendl Simmons 2-10) by eight wickets. Chennai Super Kings were bowled out for 118 mere runs in 19.4 overs whereas Trinidad & Tobago hammered 119 for the loss of just two wickets with 29 balls still available. Lendl Simmons (Trinidad & Tobago) was announced ‘Player of the match’ for his brilliant display both with ball and the bat. The 20th match of the Champions League Twenty20, Group B was played on Wednesday, October 2, 2013, at Feroz Shah Kotla, Delhi. Earlier, Denesh Ramdin, the skipper of T&T won the toss and preferred to chase. CSK lost their prominent opener, Michael Hussey for just one run when Murali Vijay along with Suresh Raina went for the consolidation. They took the score to 36 in 5 overs and got 13 runs in the next one with 1 six and 1 four. The second wicket partnership was broken at 62 when Vijay was clean bowled by Lendl Simmons for 27 off 24 balls with 4 fours. The captain of CSK, MS Dhoni, walked in next and Raina became the next victim at 78 at his personal score of 38 off 29 with 1 six and 3 fours. The incoming batsmen were unable to go along well with Dhoni and three of them gifted their wickets with the run outs. He witnessed the downfall of his partners at the other end after the rival bowlers took over. Dhoni was the sixth batsman who went back to the pavilion for 25 off even deliveries with 2 fours. The innings of the entire Chennai Super Kings was rolled back for 118 in 19.4 overs. Rayad Emrit was the top wicket taker with three whereas Ravi Pampaul and Lendl Simmons shared two wickets each. Simmons and Evin Lewis started off reasonably well by scoring 15 runs in the first three overs with one four each. Lewis hit 3 boundaries in the next over followed by another two in the 6th one and Simmons kept the score board ticking at his end. The latter dispatched two consecutive sixes and one four in the 10th over bowled by Ravindra Jadeja. 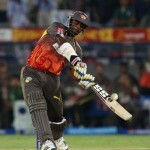 Lewis was declared leg before wicket off Suresh Raina for 38 from 35 balls with 6 fours and was replaced by Darren Bravo. Lendl Simmons was dropped at 48 by S Badrinath off Jason Holder and the batsman responded with his 13th Twenty20 fifty in the 13th over. Simmons hit another four and a six before he was caught by Sharma off Ravichandran Ashwin for 63 from just 41 balls with 4 spicy sixes and 5 fours. Bravo got the winning run on the first delivery of the 16th over as the total touched 2-119. 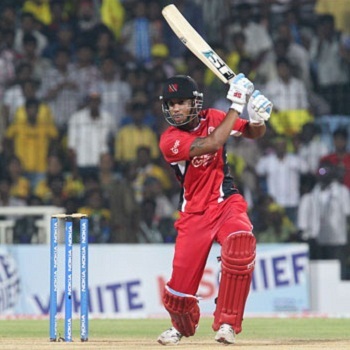 Trinidad & Tobago triumphed against Chennai Super Kings with a huge margin of eight wickets and became the pool leaders.